Taskbar Meters expand the Windows 7 taskbar beyond the static icon and dynamically update to show the utilization of system resources. 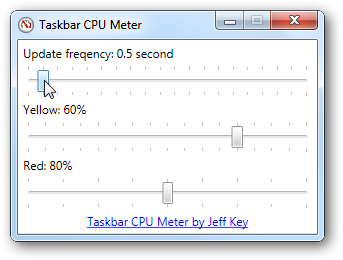 Made up of three separate programs, Taskbar Meters show CPU usage, disk IO and memory utilization. When a meter is running you will be shown the update frequency and color customization settings.